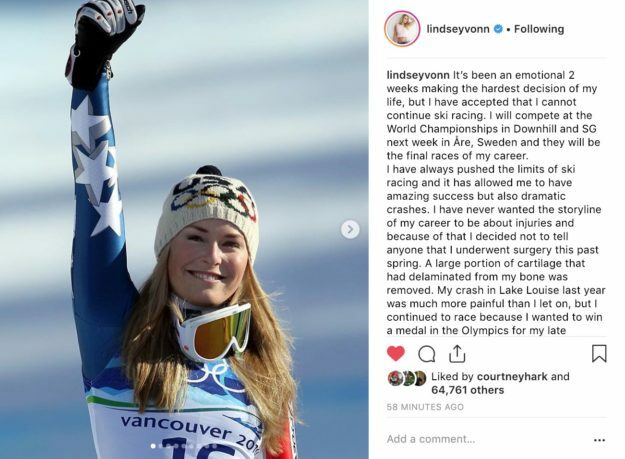 Lindsey Vonn announced her retirement on Instagram. The greatest female ski racer in the history of the sport, who rose to greatness as a Ski and Snowboard Club Vail athlete and calls Vail her home, is retiring after the upcoming World Alpine Ski Championships next week in Are, Sweden. Known as the most successful female ski racer in the world – Lindsey Vonn (Vail, Colo.) – announced on Friday that she has decided to retire after what will be her eighth World Championships bid in Åre, Sweden. Vonn is the only American woman to ever capture downhill gold at the Olympics and the only American woman with four World Cup overall titles. Six weeks after she turned 20, Vonn (then Kildow) produced her first World Cup victory in Lake Louise, Alberta. She has since captured an all-time win record on the women’s side with 82 World Cup wins. In addition to her 2010 Olympic downhill gold and super G bronze and her 2018 Olympic downhill bronze, she holds seven World Championship medals, including double gold in 2009. In her post on Instagram, she stated that she will compete in the downhill and super-G in Åre, which will be the final races of her career. It’s been an emotional 2 weeks making the hardest decision of my life, but I have accepted that I cannot continue ski racing. I will compete at the World Championships in Downhill and SG next week in Åre, Sweden and they will be the final races of my career. I have always pushed the limits of ski racing and it has allowed me to have amazing success but also dramatic crashes. I have never wanted the storyline of my career to be about injuries and because of that I decided not to tell anyone that I underwent surgery this past spring. A large portion of cartilage that had delaminated from my bone was removed. My crash in Lake Louise last year was much more painful than I let on, but I continued to race because I wanted to win a medal in the Olympics for my late grandfather. Again, I rehabbed my way back this summer and I felt better than I had in a long time. Then I crashed in Copper this November and injured my left knee, tearing my LCL plus sustaining 3 fractures. Despite extensive therapy, training and a knee brace, I am not able make the turns necessary to compete the way I know I can. My body is broken beyond repair and it isn’t letting me have the final season I dreamed of. My body is screaming at me to STOP and it’s time for me to listen. Honestly, retiring isn’t what upsets me. Retiring without reaching my goal is what will stay with me forever. However, I can look back at 82 World Cup wins, 20 World Cup titles, 3 Olympic medals, 7 World Championship medals and say that I have accomplished something that no other woman in HISTORY has ever done, and that is something that I will be proud of FOREVER! I always say, “Never give up!” So to all the the kids out there, to my fans who have sent me messages of encouragement to keep going… I need to tell you that I’m not giving up! I’m just starting a new chapter. Don’t lose faith in your dreams, keep fighting for what you love, and if you always give everything you have you’ll be happy no matter what the outcome. Thank you for the amazing years, for always supporting me, and for making my job so fun. Can’t wait to see some of you in the finish in Åre where I will give it my all one last time.